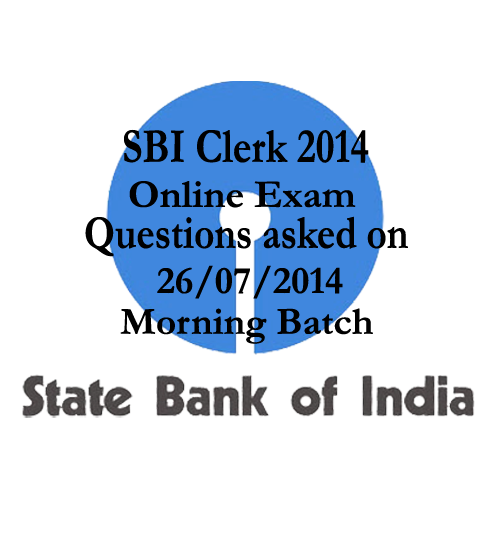 List of questions that asked in SBI Clerk Online Exam-2014 conducted on 26/07/2014(Morning Batch) with answers. Candidates those who are preparing for the examination can get idea from the questions below. Candidates those have completed their exams can share your questions in the comment box below. What is the capital of Swedan? Which Indigenous plane was developed by DRDO? Which country launched first plastic notes? In Which country there is a street in the name of A.R.Rahman? What is the function of RBI? Who is the loka sabha constituency of Sushma Swaraj? Who provides assistance to small scale industries in India? In India Which state has camel as their official animal? By using which tools does the RBI adjust liquidity? Who is the head of Cauvery water dispute? When was the international day for old person was celebrated? Who is the winner of Australian Grand Prix? In which state does Nilgiris was located? Which os the following is not true about Telangna? Where will be the 2015 common wealth head of Government was to be held? Who is the Owner of Capro group, which has won the international Business Year Award? Which Organisation is for Women Entrepreneur? In India Which state has highest Urban population? Who has signed of one rupee currency note? With which country does Japan has Sea-Conflict? Printer is an example for what? Keyboard and _____ is the input devices?